The eyebrow and eyelash areas greatly enhances your looks. The thicker, silkier & more luscious these areas are, the more demure a woman looks. They really make your face pop. Some women are blessed with this naturally while some of us have to work a little harder to get the hair looking like we want it to. There are artificial methods to fill in these places but personally, I’m like Rachel from friends with my eyes. I really really hate sticking foreign objects on them or letting people touch them with strange devices. In light of that, I started looking at natural options for enhancing the hair on the eyebrows as well as the eyelashes. Skin conditions like psoriasis and eczema. The good thing is despite all above, you can do something to reverse this thin hair. If the hair is just naturally thin, you can also fill them in and give an appearance of fullness with this rich serum. 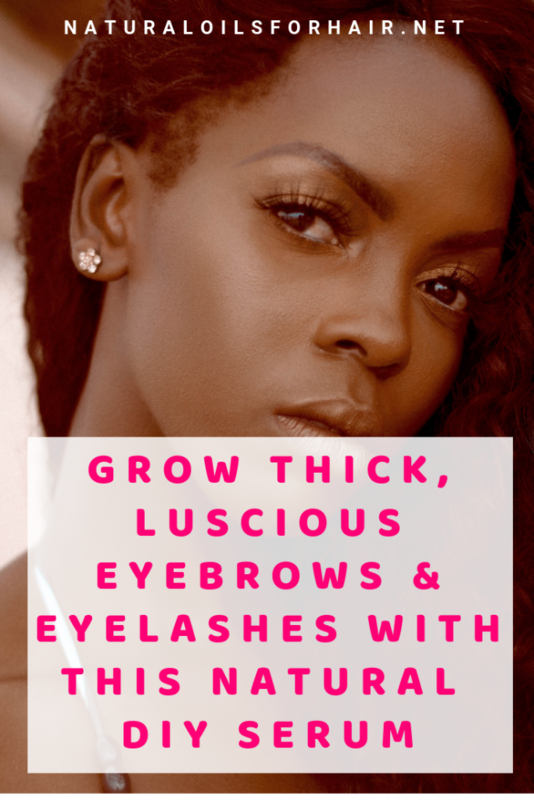 Why Use Castor Oil for Eyebrows & Eyelashes? Castor oil is common in the hair care industry and contains a lot of nutrients and phytochemicals, which aid in rapid hair growth. Castor oil also contains protein and fatty acids, which nourish the follicles and encourage hair growth. Castor oil is used in a lot of beauty products and is an ingredient in one of my calrifying toners from Eucerin. Use Banyan Botanicals Organic Castor Oil or Raw Apothecary Organic Castor Oil for this recipe. 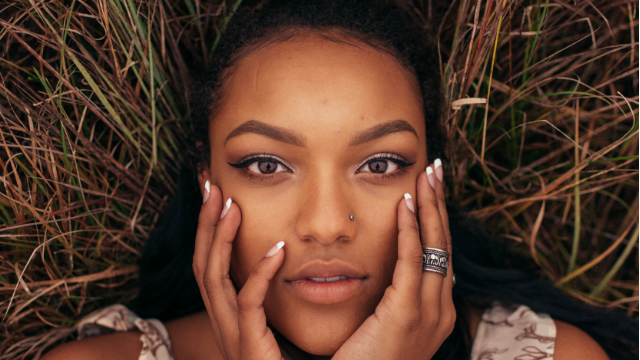 Why Use Vitamin E Oil for Eyebrows & Eyelashes? Vitamin E oil is a healing and softening oil with great antioxidant properties. It increases circulation and enhances the texture of hair, making it softer and shinier in the long-term. The best brand of vitamin E oil is Sundown Naturals Vitamin E Oil as it has a 70,000 IU. Why Use Aloe Vera Gel for Eyebrows & Eyelashes? Aloe vera has rich moisturising properties as well as significant enzymes, which softens hair and encourages silkier hair growth. 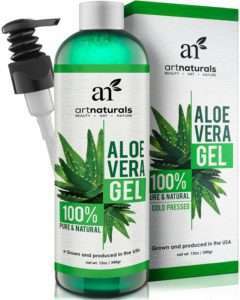 If you don’t have fresh aloe vera, try Art Naturals Pure Natural Aloe Vera Gel or Seven Minerals Organic Aloe Vera Gel. Mix the castor oil and vitamin E oil. 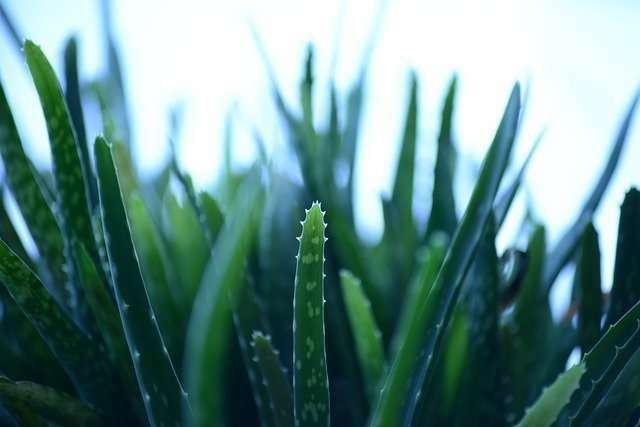 Open up the aloe vera leaf and scrape about ½ teaspoon out. Mix with the oil until smooth. If you are using pure aloe vera gel, use 1 teaspoon. Use a q-tip to apply the mix generously on both eyebrows. Massage a little bit. Apply the serum lightly to your eyelashes with your fingers. Work it through from root to tip. 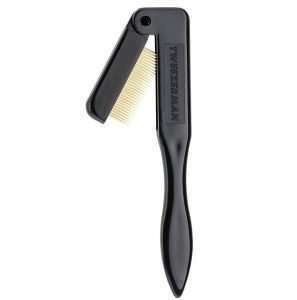 If you have a clean eyelash comb, you can use this to help with distributing the serum. Leave on for 45 minutes then rinse off. Tweezerman Eyelash Comb is a good brand for this. Apply a thin layer of vitamin E oil to your eyebrows before going to bed. Repeat this every evening for 6 – 8 weeks and you should begin to see an improvement. Make a fresh batch of serum every 2 days. It’s important not to contaminated your serum by dipping your fingers into it directly so store in this handy cosmetic jar and use only a q-tip for application. Wait to see the results before modifying the recipe. If you modify the recipe do not add things like cayenne pepper, etc. Remember, this is going to be near your eyes so don’t unwittingly blind yourself. Also eliminate plucking, tweezing and waxing while trying out this recipe.